In telling my story to someone at the gym this morning, it got me thinking…how many of you actually know my story? If you’ve read my ‘About Me’ section, then you’re somewhat familiar, but I’m sure many of you don’t know some of the finer details of how I got to be where I am today. First off, I stopped eating red meat at age 17, after seeing some terrible PETA videos and then stopped eating all other meat (which was only chicken and turkey for me) at age 19. So, I didn’t eat red meat for 10 years, and chicken and turkey for eight years. Additionally, I was vegan for two years during that time period. During my vegetarianism, I never anticipated eating meat again even though I was bloated all the time, hungry often and regularly had stomachaches. Though, I admit, it didn’t always start out this way. In the very beginning, things felt pretty good…until they didn’t. Anyway, my belly was often pooched out and my mom always made a point to tell me, specifically during my vegan years when I was living at home. I knew it was bloated, but always tried to dismiss it. Sometimes, I’d even get mad. Just before and during my vegan years, especially, I was way underweight and unhealthy, even though I thought I was super healthy (I’m 5’8″ and weighed 108 pounds at that time; my size was a double zero). Mind you, I was also over-exercising and not consuming enough calories for everything I was doing. It got to the point where I even stopped having my period, which went on for over six months before I finally said something to my mom. I had to go on the pill to force my body to menstruate. Obviously, this didn’t actually solve the root cause. I ate everything low-fat or fat-free and sugar-free, and mentally counted calories. I was addicted to carbs, specifically cereal, and craved it ALL THE TIME. My mom couldn’t keep enough cereal and soy milk in the house and every time I’d go to the store with her, I’d stew forever in the cereal aisle trying to decide what to pick. I was also addicted to dipping anything in natural peanut butter, even flakes of cereal. This bad habit often clogged me up, if you get my drift. Not only that, but peanut butter made my throat feel restricted…but that was normal, right, because that’s how I always felt when I ate those foods? 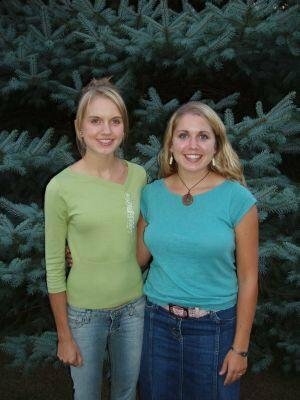 With my sister in 2005. I was 20 years old at the time, and at my thinnest weight, 108 pounds (on a 5’8″ frame). My body fat percentage was somewhere between 10-12% (can’t remember exactly), which is very low for a female. Fast forward a few years, and I ditched the vegan thing and stuck with just being a vegetarian. I started to focus more on natural, whole foods and ate a lot more beans, brown rice, quinoa, oats, etc. and luckily, I’ve always been a big fan of veggies and fruit. I was still working out a lot, but wasn’t as thin as I had been and additionally, became more interested in yoga. Then, about 1.5 years after moving out to Portland, I realized I could not tolerate gluten, most dairy (except for butter/ghee and yogurt) and peanuts, so cut it out of my diet. Some of my bloating and digestion issues improved at this time, but then came back with a vengeance and continued to get worse. Stomachaches and painful bloating every single day — usually starting around lunchtime and lasting until I went to bed at night. Come morning, I’d often have some relief, but then the cycle would repeat all over again. I complained consistently and every time I told Jesse my stomach hurt he’d say, “What’s new? You always have a stomachache.” This was becoming my “normal” far too often. Anyway, that’s where I’ll stop for now. To read more about my story, check back tomorrow for part II! Looking forward to the rest. Amazing how we come to realize what foods we’re eating really cause our problems! Thanks @flamidwyfe! I agree, it is truly amazing. It’s funny how we dismiss so many things as normal that really aren’t okay or good for our body. Those are signs and signals that something is wrong, but until we’re wise enough to realize that, we just go on living with whatever troubles us, thinking it’s normal. Food can heal and change all that and it’s a wonderful thing to experience. Congrats on your weight loss! That is quite the feat! Yes, you did lose a whole 20-year old me!! So excited to hear the rest of this! It’s funny how soy milk is marketed as such a “healthy” alternative and now I won’t even touch it. Aw, thanks! Yes, it is funny and coincidence because it’s not healthy at all, as we both know. These days, I couldn’t touch the stuff even if I wanted to! Interesting, and so true how food is such a HUGE part of our well-being! It can either nourish us or break us down. Oh and soy! I remember when it was all the rage and now I cringe when I see it! I had a man ask me the other day at whole foods what brand of soy milk was good to give to his kid and I just looked at him and said ummm none! He looked shocked and I didn’t really have the time to tell him why but I just said I don’t drink soy and he didn’t seem interested in knowing why. I appreciate hearing your story! I was a vegetarian for 5 years just up until two months ago when I started transitioning to a mostly Paleo diet. I used to own and run a small retail baking company so I’m still phasing out baked goods from my diet [as you can tell from my blog posts! =)] but when I have a run of several days in a row of only Paleo eating I can’t stop telling everyone how amazing I feel. I gained about 15 pounds from taste-testing way too much and am hoping to lose those [and some more as I hadn’t been my ideal weight thanks to all the carbs + starches I ate as a vegetarian] and get back into a strong yoga practice soon. Thanks for sharing your journey from veg/veganism to paleo. Looking forward to continuing to follow along! I appreciate you reading my story, Alexandra! It really is amazing how different you feel eating paleo versus eating vegetarian, isn’t it? I never ever would have thought I’d be eating this way, but I’m so grateful that the shift happened, even if it was initially for medical reasons. That’s pretty crazy how much taste-testing adds up, but I guess when it becomes a regular thing, it’s kind of a given. I bet that weight will drop off in no time with eating paleo and getting back to yoga.